Marine conservationists have warned of the dangers of swimming with dolphins after two women were badly hurt by the same dolphin within a 10-day period. One woman sustained a broken rib, compressed vertebrae and lung damage when she was rammed by Dusty the dolphin off the Irish coast on Sunday. Ten days earlier, another woman was rammed in the abdomen by Dusty while swimming in the same County Clare area. The Irish Whale and Dolphin Group has erected warning signs at Doolin pier. The conservation group said both women were taken to hospital by ambulance after the two separate incidents. "Clearly this level of injury is very serious and a fatal attack could easily happen," it said in a statement on its website. Dr Simon Berrow, executive officer of the IWDG, said Dusty is an adult, female bottlenose dolphin that was first spotted by Irish fisherman off the County Clare coast about 15 years ago. Dusty's movements have been tracked since 2000 and she has become a popular attraction in the Doolin area. He said the two women are not the first people to be seriously hurt by Dusty in recent years. 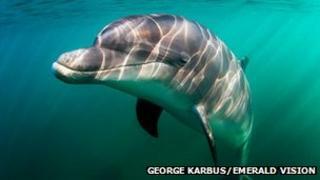 The group reported that there have been at least three other previous occasions where people have been rammed so hard by the dolphin that they were admitted to hospital. About two years ago, one woman was medically evacuated back to Germany after she was rammed by Dusty in Fanore, County Clare. Dr Berrow said it was unclear why Dusty had rammed the swimmers, but added he was reluctant to describe it as "aggressive" behaviour, as the dolphin may not have hurt the swimmers intentionally. He said dolphins are known to kill porpoises and dolphin calves by ramming them, but the movement is also used as a form of "rough play" with other adult dolphins. Dr Berrow said Dusty should be socialising with other adult dolphins, where such behaviour would not cause serious injury. But he added that when she was swimming with humans, the consequences could be very dangerous. The IWDG said that after the woman was injured by Dusty in Doolin on Thursday 18 July, they were contacted by Clare County Council and asked to erect warning signs. "It is IWDG policy to discourage people swimming with whales and dolphins in Ireland. The risk is not only to humans but also to the dolphin as habituation to humans increases risk of injury or death to the dolphin," the group said in a statement at the time. They repeated their warning to swimmers after the latest incident on Sunday, 28 July. They said the second woman was rammed by Dusty while she was trying to climb out of the water at Doolin pier. She had to be helped out of the water by people on the pier before she was transferred to hospital by ambulance. The IWDG's latest statement said: "Clearly a contingency plan needs to be developed with the relevant and competent authorities in the near future on management of Dusty and people in Doolin. "But at present we would like to get through what remains of the summer without further incident."